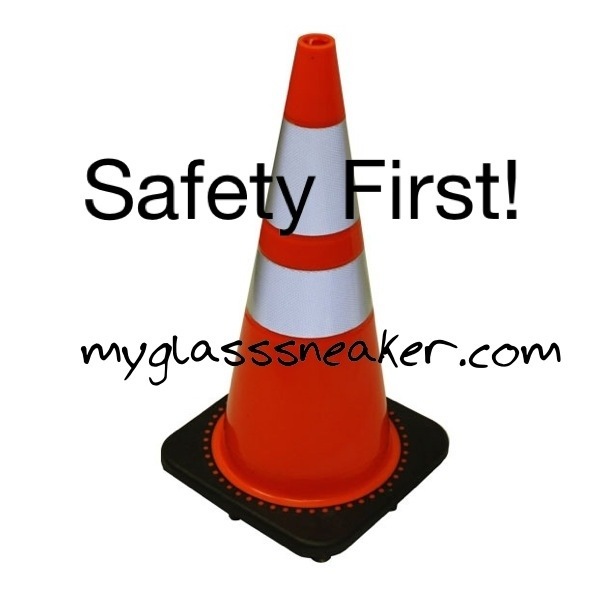 There’s something that’s really been weighing on my mind lately: safety. I’ve been hesitant to write this because you can do a search for safety using any search engine available to you and get hundreds of articles written by a lot of people who are a lot more qualified to write on this subject than I am. So why am I writing it now? Recent events have made me realize that, just like the 999 happy haunts in Disney’s Haunted Mansion, there is always room for one more. Just this weekend a runner close to where I live was hit by a train. A train, people! Tragically, the runner was killed. Care to guess what the news media chose to highlight about this story? The runner was listening to music using headphones. Also yesterday a cyclist was hit by a big tractor trailer truck and killed. I read stories all the time in my running groups where friends had close calls. So, yeah. There’s always room for one more story on safety. I’d be lying if I said I follow safety guidelines all the time. We all get complacent. We get in a routine where things feel comfortable. At the same time, every time we are out there, anything can happen. There is no substitute for good judgement. In no way is this list intended to be all-inclusive. These are just the best guidelines I can think of that I try to incorporate in my running life. Make sure someone knows where you are and how long you will be there. If I go missing, I’d like for someone to report it at the earliest possible time. I always have my phone on me. My family knows where I am, what my route is, and how long my planned run will take. Often, friends and family stay in touch with me during the run, too. This is not just in case I get kidnapped (highly unlikely). It’s also in case I collapse or fall and break something. Carry ID on you at all times. I always carry my driver’s license in my pocket. If I do have some sort of accident, I want someone to know who I am. There is also a company called Road ID that makes custom ID bracelets with your info. A lot of people I know have those, too. Run AGAINST the traffic. I do not like running on actual roads with cars unless it’s part of an organized race, and I don’t have to share my side of the road with anything motorized. Some of you do, and I get that. I am fortunate to have access to a network of paved trails long enough to cover any length I would want to run. Not everyone has that. Also, sometimes you just need a change of scenery. So, if you are going to be sharing the road with cars, please, please, please run against the traffic. You can see the cars coming at you in time to get off the road if need be, and they can see you better, too. That being said, always assume they do not see you. The roads are full of distracted drivers. Truth! Be visible. Wear reflective clothing. Wear bright clothing. If you are running at night, wear those annoying flashing lights along with your reflective, glow-in-the-dark clothing. Whatever you have to do, however you have to do it, be seen! Be aware of your surroundings. Yes, this means audibly just as much as visibly. You might want to think twice about listening to music. Truthfully, I rarely run without my headphones. However, I have the sound low enough that I can still hear what’s going on around me, and sometimes I just wear one headphone. No, I don’t run where there are cars very often, but I do share paved trails with cyclists. Some of those riders are flying! I want to hear them coming up behind me. Plus, I frequently get passed on the trails by other, faster runners. I want to be able to get over so they can get by me, too. Hydrate. This is more of an internal safety issue as opposed to your external surroundings, but it’s every bit as important. It’s hot out there, y’all, and this is the time of year when over heating is a real concern. 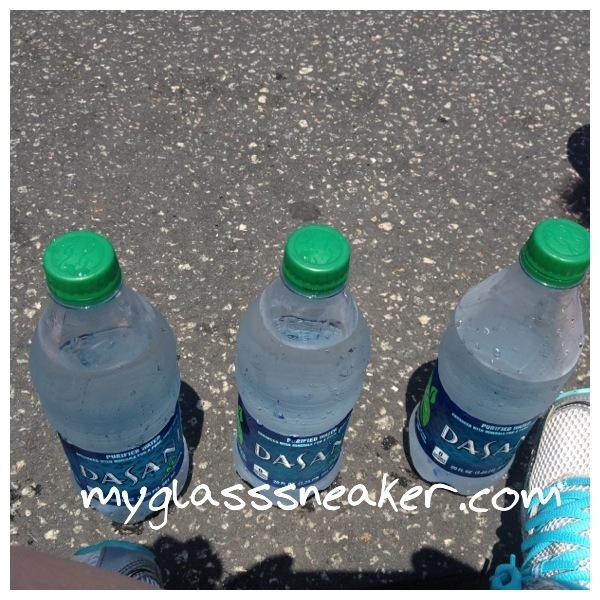 I don’t go out without hydration at all, even for a few miles, when it’s hot outside. Sure, you can hydrate all day long every day but it’s just as important to hydrate during your activity, too. Have an exit plan. Always have a strategy for how you are going to get yourself out of a situation where you feel unsafe. Pop up thunderstorms can happen in the blink of an eye this time of year. Also, sometimes you just get an uneasy feeling about your surroundings. Is there a friend nearby who can pick you up? Is there an alternate route you can take? Is there a store or restaurant where you can take refuge for a bit? Sometimes my plan is to simply run loops close to my car so I can get back to it in a hurry if I need to. There is safety in numbers. I personally don’t like to socialize while I’m running. I wish I was one of those people who could chat away for 12 miles, wondering where the time went. I can’t. The only way for me to ever get into “the zone” is if I don’t talk to anyone. That being said, I will sometimes run in a group. I just don’t talk to anyone very much while I’m running. A lot of people find groups intimidating but they can be a real comfort. Usually everyone still runs at their own pace. Some are chatty. Some, like me, are not. At any rate, I like knowing there is a group of people who know I’m out there and can help me if I get into any sort of trouble. Be safe out there, everyone. I don’t like to hear about these runner accidents. We are out there doing something good for ourselves, and I don’t want any of our stories to end in tragedy. Is there anything you would add? Tell me in the comments.